This is the east window of the north chapel, dedicated "To the glory of God and in memory of our beloved King, Edward VII, who died May 6 — 1910." 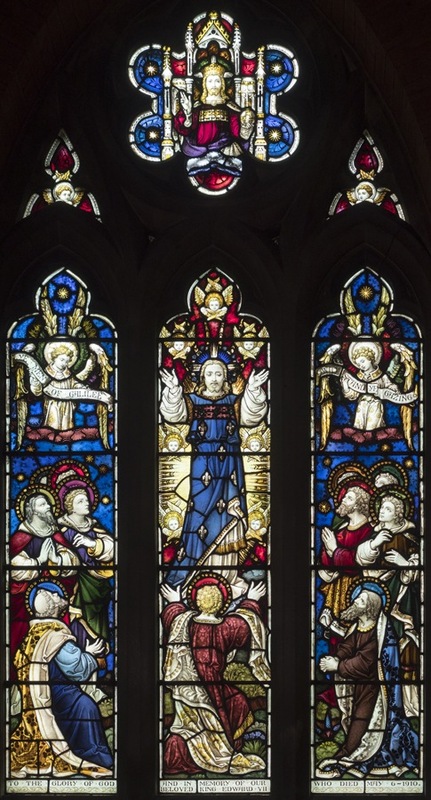 From the gowns of the saints kneeling on the grass, to the little angels peeping above and beside Jesus, to the architecture around God the Father in heaven, the whole window is densely detailed and richly coloured. Every inch glows with (mainly) cerulean blue, with red contrasts and gold highlights — one of the firm's most beautiful windows, making it indeed fit for a king. Photograph by John Salmon and text by Jacqueline Banerjee. Eberhard, Robert. "Stained Glass Windows at St Alban." Church Stained Glass Windows. Web. 10 July 2017.